In my last post, I discussed the reasons we don’t practice Lent as a church. In this post, I’d like to sketch out the reasons we do practice Lent. 1. We practice Lent to enter into the sufferings of Christ. The stories we tell ourselves about reality shape us. They shape who we are, what we believe, and what we desire. Christians want not only to believe the story about Jesus cognitively but to get it into us– into our very bones. It’s the difference between assenting to the fact that Bono is an Irish rock star and finding yourself screaming along with him at a U2 concert. We want to think, confess, and understand, but also to encounter, worship, and be transformed by God. The primary way we do this is through liturgy in both word (reading and preaching about the bible) and sacrament (baptism and the Eucharist). But we also do this through practicing the Liturgical seasons like Lent. In order to know the Good News about Jesus holistically, beyond something that we work out in our brains like a word problem, we try to enter into this story with our bodies. I have a friend who gives up meat and dairy every Lent. She is an incredibly gifted chef and total foodie. Her passion for butter rivals even mine (and I would go to a church made entirely of butter if I could). Lent is hard for her as you’d imagine. But she isn’t joylessly trudging through the season. She takes up this yearly practice with even a sort of humble gusto because it teaches her, year by year, through her stomach, that Jesus who was in the very place of perfection, a place with pleasure more abundant and powerful than even (dare we imagine it?) the best, richest butter ever made could give, left that place to be with us and called it a joy to do so. Her practice allows her to taste a tiny thimble-full of what Jesus experienced in his self-emptying and that helps her to be shaped by His story. 2. We practice Lent because it reveals our idolatry and helps us to repent. There are certain things that are good in themselves but that hold too much power in our life. When there is something without which we feel like life is meaningless or that we catch ourselves thinking we’d ‘simply die’ if we didn’t have it, it is likely occupying a place in our life that it was never meant to hold. I have a friend who gave up alcohol for Lent one year. He’s not an alcoholic but he found that he was relying on alcohol to get through social events in a way he felt was unhealthy. Now, he still drinks alcohol but he returned to it freer, knowing that it was not what made him okay and able to abstain from it more readily. Some of us would do well to limit our working hours or practice Sabbath keeping over Lent to repent for how we rely on work or busyness to make us feel okay. I have a friend who gave up her smartphone for Lent because she felt like technology had become ,in some sense, a god in her life. She didn’t know how to live without being plugged in 24/7 so Lent was an experiment in letting go of a false god to rely on God. 3. We practice Lent in order to rid ourselves of distractions and focus on the Real. We live in a noisy world. Much vies for our attention. The late priest and writer, Henri Nouwen wrote about the busyness and restlessness of American life that “to celebrate life together, to be together in community, to simply enjoy the beauty of creation, the love of people and the goodness of God—those seem faraway ideals. There seems to be a mountain of obstacles preventing people from being where their hearts want to be…In this hectic, pressured, competitive, exhausting context, who can really hear me? I even wonder how long I myself can stay in touch with the voice of the spirit when the demons of this world make so much noise.” Part of the reason that I am giving up Facebook this year is that, as much as it helps to keep me connected with others, it can add to the white noise of my life, drowning out the rhythms of beauty and grace around me. I hope to spend more time journaling during Lent, especially noting the desolation and consolation of each day, a practice that has helped me notice God at work in my life, take stock of the texture of the day, and cultivate gratitude. For me, this year, Lent is an intentional turning away from distraction and toward practices that help to quiet my noisy heart. A few years ago I began Lent burnt out and harried. I had a new baby and was working in ministry. My husband and I were struggling and I felt spent. Exhausted and depleted, I didn’t know what to give up for Lent. I was nursing, so fasting from food or drink wasn’t an option. And I felt stretched so thin, that the thought of any more deprivation made me feel unhinged. A very wise friend and priest said to me, “Don’t give anything up for Lent this year. Your whole life is Lent right now.” So that year, my Lenten practice was to leave my daughter with my husband once a week, walk to my favorite neighborhood coffee shop, and read a novel for an hour. Self-denial it was not. This habit was a joy and the most quieting tome of my week. I intentionally chose the novel The Book of Sorrows by Walter Wangerin because it is the perfect Lenten book, a story of sin and redemption in a community. During that Easter season, I had a powerful, transformative spiritual experiences when God met me and encouraged me through a particular scene in that story. But that would not have happened had I not, by God’s grace and the encouragement of my community, intentionally made space for slowness and reading in what felt like a suffocatingly cramped life. 4. We practice Lent to prepare for Easter. One of my favorite characteristics of the Christian year is that there is never a season of celebration without a season of preparation proceeding it. Whether it be Oprah, Burger King, or Joel Olsteen, the myth of our culture is that we must always be happy, fulfilled, and living our best life now! Yet, while we are all maniacally pursuing happiness, anxiety and depression are commonplace. The truth of our brokenness is relentless even in the midst of wealth, success, popularity, or a perfectly lit, magazine cover home. The Christian calendar allows us time to admit the reality that things are not the way they are supposed to be, a reality our hearts know all too well. Easter is all about the hope of the resurrection, but there can be no resurrection without death first. It can be so tempting to jump ahead in the story, to focus on the joy of the resurrection and skip over the agony of the cross. Who want to remember the crucifixion? It is painful, scornful, raw, and dark. But, only when we wait, for a moment, in that humiliating vulnerable place can the resurrection truly be good news to us. When a King comes, there is always plenty to do to get ready for Him. And so through these daily, earthy habits, we prepare to celebrate our coming King. At the end of the day, sharing in Christ’s sufferings, repentance from idolatry, quietness and Christ-centeredness, and preparation for Easter are all a gift of grace. The practice of Lent is a means of grace, but grace itself is a mystery that grips us however buttoned up or sloppy our Lenten practice is. The best thing I have read about Lent this season was a little note that my priest, Fr. Thomas McKenzie, sent out in our church’s Lenten worship schedule. 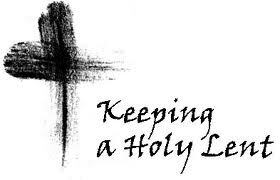 “Please remember that keeping Lent is designed to make more room for the Holy Spirit in your life. Keeping Lent may or may not lead to feelings of joy, sorrow, happiness, or anger. You may or may not alienate a friend, have a spiritual experience, lose weight, or feel grouchy at work. Keeping Lent will not make you more holy or beloved in the eyes of God. Keeping Lent will not save you. This coming Wednesday is Ash Wednesday, which begins the Lenten season. Lent marks the 40 days before Easter (excluding Sundays). It is a liturgical season focused on repentance, penitence, and preparation. What most people think of when they think of Lent is the practice of ‘giving something up for Lent’. My dad dated a Catholic girl in high school before he met my Mom. I don’t think they were very serious, and when I ask him why they broke up, he always responds, “She gave me up for Lent.” I’m not sure if this is true or not, but we all know someone who gave up something–be it coffee, chocolate, or dating my dad—for Lent. I didn’t grow up practicing Lent, but I am now in the Anglican church where Lent is practiced by our community. Many of us fast from something (give something up) or take on a practice or both during Lent. For those of us who didn’t grow up with this practice (and even many who did), there can be some misconceptions about why believers do and do not ‘keep Lent.’ These are worth addressing so we can better understand and explain why we enter into Lenten disciplines. 1. We don’t give things up because we think they are necessarily bad or immoral. This year, I’m avoiding Facebook during Lent, but that is not because Facebook is bad or sinful. I could make a good argument (and in fact have argued frequently) that Facebook is a good thing. When people give up chocolate or meat or alcohol or coffee, it is not because we Christians think that if we enjoy something, it must be bad. Coffee, meat, alcohol and especially chocolate are very good things that show God’s goodness, creativity, and provision. Of course, Christians ought to be interested and working toward breaking habits of sin–gossip, lust, judgment, anger, pride, and so on, but this is called repentance, which is certainly not limited to Lent. I’m not giving up Facebook in the way that I’m repenting of (and trying to give up) anxiety or impatience with my toddler. The former is a neutral or even good thing that I am choosing to fast from for a season. The latter is a manifestation of my brokenness and is a way that I’m failing to love that I need to allow God to change and heal. 2. We don’t practice Lent to earn anything from God. Salvation is received solely as a gift (we call this ‘grace’.) And I daresay that God, who made all that is and sacrificed Himself to rescue us, is entirely unimpressed by my ability to go without sugar for 40 days. I once heard a pastor preach about how giving something up for Lent is a pointless or even harmful practice, arguing that the reason people practice Lent is because they “hate repenting.” The idea was that in Lent people give something up to sort of “score points” with God so we don’t have to actually recognize ourselves as sinners. We can sit and bask in our own self-righteousness as we sanctimoniously say, “No I would not like that glass of red wine. I gave it up for Lent,” and smile self-satisfied at how righteous we are. I’m sure people out there have practiced Lent in this way (though I don’t know any of them). But if you do, for the love of God (literally), drink the glass of wine. Drink two. 3. We don’t practice Lent out of obligation or duty. This way of thinking is the other side of the coin of #2. We Anglicans (or Catholics, Lutherans, et. al.) don’t think God will be mad at us if we don’t practice Lent. It isn’t a legalistic obligation to avoid God’s wrath. We believe that the entirety of God’s wrath was poured out on Christ in the crucifixion. God took our punishment on himself in its entirety. We don’t have to avoid meat or chocolate for forty days to try to make some kind of (pathetically small) recompense to an angry God. Christians believe that God actually delights in us because of what Jesus did and not at all because of what we do. Lent or no Lent, we are welcomed by God. So why do we keep Lent? Stay tuned. Click here for more in Monday’s post. 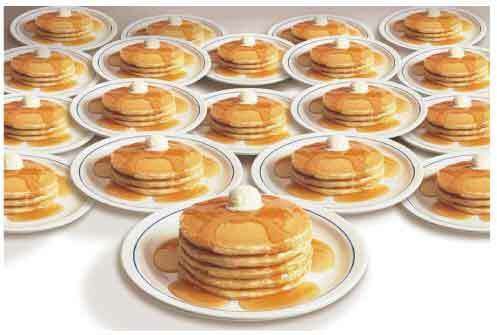 Yesterday was Shrove Tuesday in the Anglican tradition, also known as ‘pancake day’. For the past few years, my small group at Church of the Redeemer has had a gathering in which we have consumed huge amounts of pancakes, beer, sausages, and whatever other comestibles we’re giving up for Lent. One of the men in our small group is Northern Irish, and the first year we did this he suggested that we incorporate some customary U.K. Shrove Tuesday practices. He mentioned as a for instance the ‘pancake relay’, but we had no idea what that meant, so we made up our own pancake games, including pancake flipping, pancake races, and pancake tossing competitions, among other things. It’s been a wonderful and celebratory communal event binding us together as a group. Last year my daughter was just under one and not really aware of what was going on in this celebration. It’s really funny to look at pictures and videos of her from this time period. She’s always looks pretty confused, even freaked out at times. But this year was different. She’s finally started walking and talking and has developed a robust emotional and social life. It turns out that my daughter is extremely socially driven and is a even bit of a ham. She was a late walker, and the turning point for her came a month ago when she walked across the room to me in the presence of our small group and everyone cheered her on. It was as though a light bulb came on in her head at that moment, and she’s been walking ever since. I loved watching her at last night’s pancake fest. She has taken a special shine to our friend Grace, so when Grace showed up with her son, my daughter made a beeline for her and asked to be held. For the rest of the night she ran around with a huge smile on her face, peals of laughter punctuating the evening’s festivities. The Psalter is the vicarious prayer of Christ for his Church. Now that Christ is with the Father, the new humanity of Christ, the body of Christ on earth, continues to pray his prayer to the end of time. This prayer belongs, not to the individual member, but to the whole Body of Christ. Only in the whole Christ does the whole Psalter become a reality, a whole which the individual can never fully comprehend and call his own. That is why the prayer of the psalms belongs in a peculiar way to the fellowship. Even if a verse or a psalm is not one’s own prayer, it is nevertheless to prayer of another member of the fellowship; so it is quite certainly the prayer of the true man Jesus Christ and his Body on earth (Life Together, pp. 46-7). There is no greater privilege imaginable to me than to be counted with my wife and my daughter in the mystical body of Christ and to participate in the divine life of this body in the outpost called Anglicanism. At the beginning of Advent, just when nights are getting long, cold, and perfect for fiction, I decided that I wanted to read something classic and I found a collection of Jane Austen’s work for cheap in half-price books. I began reading Pride and Prejudice. I had never read it before even though I had seen the Colin Firth movie version multiple times, which is great, and the Kiera Knightly movie version, which is lousy. Once I picked it up, I read it daily as much as I could. I never wanted to put it down. I finished it on Christmas day in front of a cheery fire knowing that I had a new book in my top ten list. Austen’s writing is bright and makes me feel clean and hopeful. The whole time I read it, I thought a lot about virtue and, specifically, I thought about the fruit of the spirit. For Advent, Jonathan and I gave up cursing. It’s not that I really think cursing is bad thing. A well-placed cuss word can be just right at times. But for people like us who are rich in words and poor in kindness, cursing is a gateway drug to over-anger. A dashed out curse word can take a little argument or a little annoyance and make it rage, like fuel on a small bit of kindling. Trying to give up bad tempers altogether was more than we could tackle, but we could give up cursing. Since we cuss enough that we both do it without noticing even, having to simply slow down and think about what to say in situations of stress, conflict, or tiredness, helped us to be calmer and kinder. Because of this Advent “fast,” December was full of thoughts and conversations about gentleness, kindness, patience, peace, and self-control.I come from a long line of bickerers. I have grandparents that through their decades of marriage honed bickering into a near art-form. I have come to realize that knowing how to speak politely to family members, isn’t really something that comes naturally to me or that I’ve had much training in. Texans call a damn spade, a spade, which is a great thing that I don’t want to give up, but I wondered how to hold onto this kind of truth-telling and learn gentleness as well. I really feel like, as embarrassing as this is, I need a tutor in basic civility and kindness in my home. I found this in Austen’s characters.Elizabeth Bennett (and even Jane) are not at all simpering mealy-mouthed saccharine dolls. They are strong and opinionated. They understand themselves and the world around them. Elizabeth has this way of telling people around her that they are idiotic or obnoxious while remaining careful, respectful, and even polite. She is honest and authentic and yet kind and gentle. Virtue, in Austen’s writing, is not bland, legalistic, or passive. It is powerful, bold, and charming. Restraint does not diminish the honesty of a conversation, but allows hard truths to be spoken (about too much pride and too much prejudice) in a way that doesn’t belittle a person. Austen knows that politeness and manners can be empty and shallow and a veneer for all kinds of vice. See Mr. Collins and his obsequious, over the top formality. But she points to another kind of disciplined civility in her characters that gives them, well, character.